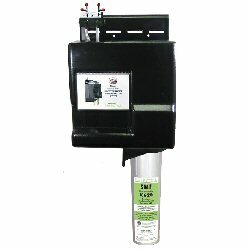 Water Booster Data: McCannâ€™s 2 Gallon, 115V, 60 Hz. Oz. Available from 80 â€“ 100 psi: 21 Oz. Total Reserve Available at 40 psi: 93 Oz. * Independently tested by an E.P.A. approved laboratory to ANSI/NSF Standard 42 & 53 specifications for the reduction of Cyst, Particulate Class I, Chlorine, Chloramine, Taste and Odor.